MADAM Halimah Yacob, who heads the senior advocacy group in the People's Action Party, wants the law on raising the re-employment age from 65 to 67 to kick in by Budget 2016. But this move would hinge on the outcome of the incentives the Government plans to give companies from next year to coax them into raising the age voluntarily, the former top union leader, who is now Speaker of Parliament, told The Straits Times yesterday. 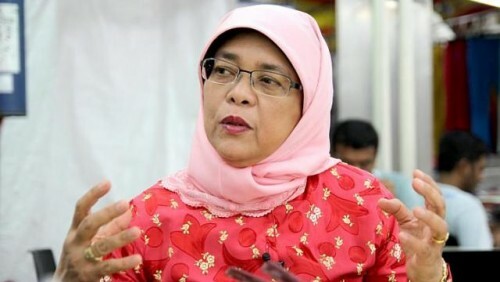 Madam Halimah was elaborating on a position paper that the PAP Seniors Group (PAP.SG) submitted yesterday to the Ministry of Manpower (MOM), calling for a quickening in the pace of implementation of the law. "It should have been done yesterday, but companies would have raised a hue and cry," she said. "Changing the law by the next Budget is also out, because that's when the incentives will be announced, so I'm hoping it will be legislated by Budget 2016." She added: "One year is as good as any to assess if the incentives work." The national Budget is typically unveiled in February and takes effect on April 1. The PAP.SG, in arguing for legislation, believes the incentives will not be as effective as the law in getting companies, especially those in the non-unionised sector where most people are employed, to raise the rehiring age to 67. It pointed to how companies were reluctant to raise the retirement age from 55 to 60 before the law was changed. Only 10 per cent of them did so in the two years before the Retirement Age Act was passed in 1993. The Government also set 2003 as the target for having people work until age 67. Despite the delay, the MOM is taking the gentler approach, though existing laws give Manpower Minister Tan Chuan-Jin the power to raise the re-employment age to 67 without having to change the law via Parliament. When contacted, Singapore National Employers Federation executive director Koh Juan Kiat said more time is needed to ensure a smooth transition. "Let's see how the promotional efforts work out, so companies can develop a human resource policy over the long term to accommodate an ageing workforce." Beyond the law, the PAP.SG gave other ideas on how to encourage companies to raise the rehiring age earlier. These include having the ministry urge employers to use existing grants to rehire older staff, and to ensure better use of training opportunities for these workers. The training participation rate of workers aged 50 to 64 is 23 per cent, compared with 40 per cent for those younger than 40, the PAP.SG noted. The group also suggested giving more incentives to companies that raise their rehiring age earlier than others. In response, the MOM said it will take into account the PAP.SG's views. "The Government is committed to helping our seniors work as long as they are able and are willing to," its spokesman said. "The promotional approach was the result of careful deliberation and balancing the concerns of both employers and workers. This was with a view of maintaining the long-term employability of our older workforce," she added. In a separate note to the PAP's central executive committee, the party's highest decision-making body, the PAP.SG asked that free lifetime membership be given to the party's pioneers. These are people aged 65 and older and who have been members for at least 25 years. The membership fee is $9 a year. The lifetime membership will signal to younger members the importance of the veterans, given their experience as community volunteers, the group said.